Melvin Douglas Smith, the firstborn child of Carl and Agnes Smith, was raised in Alamance, North Carolina, a small village near Burlington. Doug, along with his three sisters and one brother, always loved the beauty of water, and he grew up swimming and fishing. 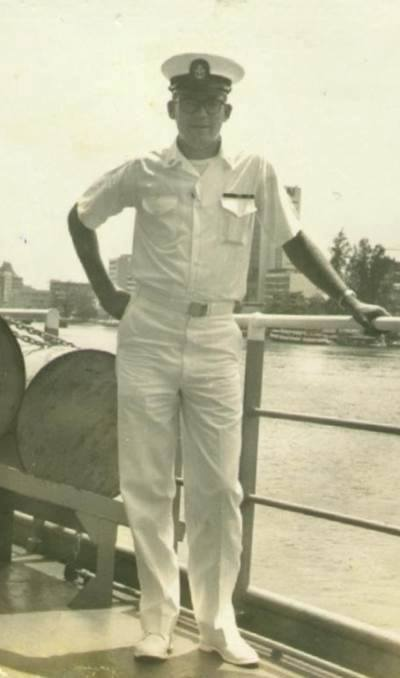 After leaving E. M. Holt High School at eighteen, he followed that love of water to the Navy, which he joined in April 1956. When he finished boot camp, Doug entered Navy communications school, and then returned home on leave to marry Judy Lyon, whom he had dated since she was 16. The couple moved to Puerto Rico in 1959, and their first two sons, Douglas and Mark, were born there at Rodriguez Army Hospital. The family later moved to Pensacola, Florida, where Doug served as a teacher in the Naval Communications Training Center. (In October of 1967, Smith Hall, a dormitory there, was dedicated in his memory.) He achieved his chief’s rank, eight years after entering the service, and also took up golf with a passion. According to Judy, Doug had always been a reader, and now he devoured “book after book after book on golf.” He was soon shooting regularly in the 80’s. In May of 1966 Doug received an assignment to sea duty, and he boarded the USS LIBERTY on May 31, 1966. The family had moved back to North Carolina, and another son, Tim, was born there. The LIBERTY docked on February 28, 1967, and Doug rushed home to see his youngest son for the first time. On June 8, 1967, CTC Smith was killed while serving the USS Liberty. The USS Liberty, an United States Navy technical research ship, was attacked by Israeli Air Force jet fighter aircraft and Israeli Navy motor torpedo boats during the Six-Day War. unfolding dark, restless and fathoms deep. In October of 1967, enlisted barracks (Building 1082) on board Corry Station, Pensacola FL was dedicated in CTC Melvin Smith’s honor.